Visualizing how some patients overcame SARS or MERS could suggest possibilities to combat deadly coronaviruses. 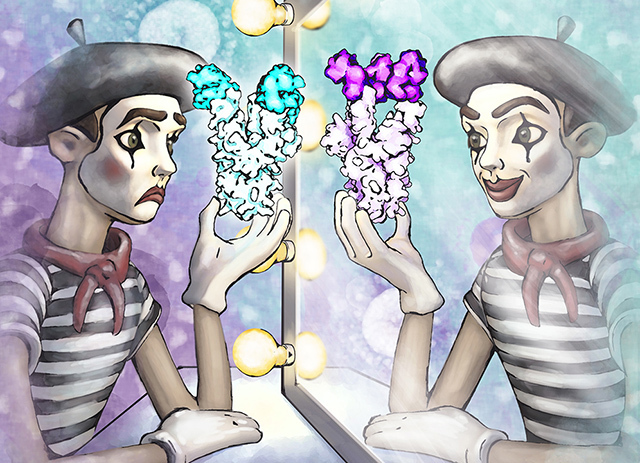 An artist's conception of antibody functional mimicry shows a mime at a mirror. Whereas his hand holds SARS-CoV S bound to an ACE2 cell receptor (teal), his reflection shows a SARS-CoV S bound to the neutralizing antibody fragment S230 (purple).